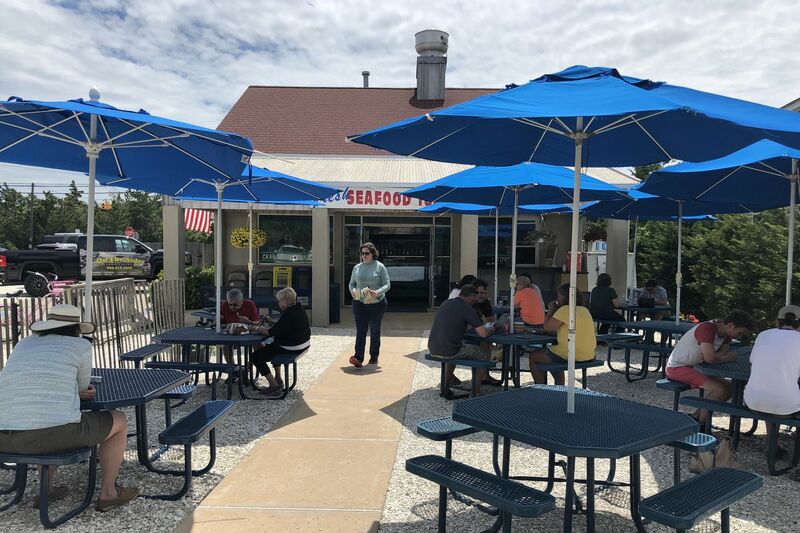 The picnic table patio at Viking Fresh Off the Hook, just beyond the fishing docks in Barnegat Light, is a destination for some the freshest scallops and seafood around. "We're the best-kept secret in Cape May County." This was said with humble good cheer by the manager who handed me a menu at Good Earth Organic Eatery. She wasn't entirely kidding. I've been scanning the Jersey Shore's restaurant landscape in search of good restaurants for the better part of two decades — but, somehow, I've missed a few. Good Earth, it turns out, has been open for six years. But I'd never noticed the blue-shuttered Euro charm of its ivy-covered stucco facade until, after perusing some farm market stands along the rustic back roads of West Cape May, I turned down Park Boulevard and happened into the gravel lot of an understated strip mall I'd never passed. I was intrigued, so I went in. There were fresh-cut flowers on the table. The smell of fresh soup simmered in the air. And I wanted to sit right down and eat. The understated exterior of Good Earth Organic Eatery in West Cape May hides a lovely dining room and open kitchen perfumed with vibrant Italian flavors rooted in macrobiotic cuisine. But I couldn't — I already had another meal planned that evening and slotted for coverage in one of my annual Shore dining packages, which, due to the tricky timing of a short season, tight deadlines, and an inevitable focus on the latest openings or a specific theme, don't allow for many spontaneous changes. Sometimes, however, the unexpected meals at those out-of-the-way, low-profile places are the most memorable. So I came back to Good Earth and was glad I did. That's why I've allotted some extra space to Shore restaurant coverage this year, dedicated to the hidden gems I've encountered a little beyond both the main roads and my own planned itinerary. An LBI fish shack with scallops supplied by its own fleet of boats. An authentic taqueria. A breakfast gem, a bakery counter where customers compete for scones and quiche, and a Vietnamese pho surprise. Sometimes these treasures are hiding in plain sight. Brown rice risotto comes studded with sustainable local seafood at Good Earth Organic Eatery in West Cape May, where the organic, dairy-free cuisine is rooted in macrobiotic principles with an authentic Italian accent. There's a bit of a time-warp, hippie co-op feel to Good Earth Organic Eatery. That's in part due to terminology that feels like a throwback to the days when "organic eatery" was a novel selling point and the notion that a kitchen cooking food that happened to be vegan wouldn't startle its customers by also serving seafood. But there's a good reason this charming and homey restaurant with an open kitchen isn't in total sync with current American health trends: co-owners Hilary Keever and her husband, chef Contrano Rosettani, moved to West Cape May a few years ago from Le Marche in Italy, where they worked on an organic farm and were inspired by the macrobiotic school of cooking, a spiritual yin-and-yang approach to "curative" eating that places heavy emphasis on whole grains and vegetables, but that also permits fish and shellfish. "That's how we eat; that's who we are," says Keever, a Connecticut native who lived for 12 years in Italy, where she met Rosettani. Sunflower seed pesto is one of the winning plates at Good Earth Organic Eatery in Cape May, which focuses on local, organic and dairy-free Italian cooking. So there's no dairy on the menu at Good Earth, where Rosettani makes "cream" from boiled rice that he churns into gelati, and also uses to emulsify the delicious sunflower seed pesto that, served over organic ziti, is vibrant with basil and fruity Abruzzese olive oil they import themselves from l'Aquila. Whole grains are used for the fresh-baked breads. Legumes and pulses feature prominently in the flavorful split pea and chickpea soups made from vegetable broths, in the coarsely ground but delicious hummus seasoned with toasted sesame oil instead of tahini. Rosettani also makes his risotto from brown rice, compensating for its lack of creamy starch by thickening it with the sweetness of grated carrot. My plate of risotto pescatore was also studded with big sweet scallops, flaky white hunks of cod, and briny littleneck clams backed by a soft wave of fish stock that scented the rice with ginger and marjoram. There's a decidedly home-school touch to these plates — which often come with a side of "massaged" kale salad — that took me back to the health food store kitchens of yore. But Rosettani also brings an innate Italian touch for good flavors that won me over and opened my mind just a little bit more. Viking Fresh Off the Hook serves pristine scallops just steps away from the fishing fleet that brought them back to Barnegat Light. Simply grilled is among the best ways to eat them. It may be a stretch to call any place that serves up to 800 people on a busy summer weekend day a "hidden gem," and Viking Fresh Off the Hook has no doubt been a beloved destination for 16 years. But if your Barnegat Light restaurant search has been limited to a simple cruise down Central Avenue, it's not obvious where to find it. Head for the docks! This casual prepared-foods market and seafood shack with al fresco patio seating is connected to the Viking Village commercial fishing pier, which was founded by restaurant owner Kristine Larson Panacek's Norwegian grandparents in the 1920s. The seafood comes directly from the boats in that fleet. There are a number of fine dishes that benefit from the pristine ingredients — the tuna that gets turned into poke and grilled fish steak sandwiches; the mahimahi for tacos; the lobsters for bountiful, crustacean butter-dipped rolls that would be even more excellent if they used a less-bulky (non-hoagie) roll. But the only thing you really need to know about Fresh Off the Hook is that the scallops are among the best on the planet, and they're used in every way imaginable. They get turned into ceviche, quiche, deep-fried platters; smoked for poke; wrapped in crispy bacon or supple prosciutto. They get pulverized into a paste to thicken the creamy bisque with extra scallop richness. But the best way to eat them is simply grilled, with a crunchy side of fresh chips. That, many years ago, turned my children into scallop aficionados here at first bite. And as I dove into my own platter for the first time in many summers, a gush of the scallop's distinctive juiciness hit my tongue, at once saline and sweet, the meatiness of its flesh gained extra savor from the grill's char stripes, and I knew once again that it could hardly be better. Enchiladas verdes are among the authentic Mexican favorites at Cinco de Mayo in Ocean City. You could say we've been keeping Cinco de Mayo and its fresh tortillas to ourselves. Each summer, once we've completed the two-week blitz of recently opened restaurant visits necessary for my annual roundups of "what's new" in Shore dining, this humble taqueria in Ocean City is always one of the restaurants we most look forward to revisiting. The humble but festive dining room at Cinco de Mayo is decorated with colorful, evocative murals. Its understated storefront on busy West Avenue doesn't have flashy curb appeal. But its colorfully muraled interior exudes personality and neighborhood restaurant comfort. And, most important, the menu from owner Roberto Marroquin has an authentic touch with influences from Oaxaca and Guerrerro that are hard to find at the Shore beyond Atlantic City (where Pancho's is our favorite). Marroquin's red mole is especially good, its guajillo brew spicier and less sweet than the Poblano-style moles more common in Philly, and I love it over enchiladas, though the enchilada platter sauced in tart green salsa verde is also a favorite. The camarones à la diabla reflect the Pacific Coastal influence of Guerrero, the fresh shrimp stewed in a tomato sauce punchy with chile de arbol peppers. Hand-pressed tortillas are griddles to order on the plancha at Cinco de Mayo in Ocean City. Anything with the housemade chorizo there is excellent, especially the sope rounds that have thick, hand-pressed ridges. But, really, I love all of Cinco de Mayo's masa creations — those sopes, the broader huaraches, the stuffed tlayuda turnovers, and the familiar tortillas for tacos, which get griddled to order on the plancha near the door. One sleeper dish that takes full advantage: the entomatadas, a stack of four tortillas that get dipped in tomato salsa, which soaks through the velvety corn cake folds like a Mexican lasagna topped with cheese and the protein of your choice. And for dessert? Rich and creamy flan! The minimalist facade and decor of Fusion Plate is easy to miss on Ocean City’s bustling downtown strip, but its kitchen serves some flavorful Vietnamese, Thai and Chinese cuisine. If you live during the year in a city where ethnically diverse cuisines are a staple of your weekly diet, there are flavors you may come to crave over the course of an extended Shore visit. Good Asian food is one — especially if you're in one of the Shore towns beyond the international menus of Atlantic City. So I will admit to being skeptical but curious when, in a casual browsing of Yelp and TripAdvisor, I saw unnaturally high ratings for a place serving pho on Asbury Avenue in downtown Ocean City. Fusion Plate? How had I overlooked it on my frequent trips to get Counter Culture coffee at Drip N Scoop? Well, it's easy to miss. Tender and aromatic skewers of chicken satay are among the Thai-style hits at Fusion Plate. Fusion Plate is an independent restaurant attached to a franchise of the Bambu bubble tea chain, and its facade and modernist interior are so minimalist I've simply looked right past it over and over again. Stopping in for a meal, though, was a smart idea. This year-old project from the Chin and Luu families, who own another Bambu in May's Landing, is an appealing mash-up of their Chinese-Vietnamese heritage, with a little Thai thrown in. In fact, the peanut-glazed satay skewers were among the tastiest dishes. The chow fun had the smoky singe of a good hot wok. And I've heard good reports from the General Tso's lovers I know that Fusion's "Golden Chicken" is a worthy approximation without the typical oversweetness. But the genuine Vietnamese flavors are the reason to go, including a refreshing salad of shredded pickled lotus stems layered with mint, shrimp, and tender pork topped with crushed peanuts, crispy shallots, and a bright and funky nuoc mam dressing. The pho also is a big winner. The thin-sliced beef was tender, the rice noodles had snap, and the broth had a lip-coating richness shaded by star anise and charred ginger that had a slow-stewed, small-batch complexity. Crunchy textures and a refreshing nuoc mam dressing add bright Vietnamese personality to this shaved pickled lotus root stems salad with shrimp, pork and mint. No, Fusion Plate does not offer some of the scary bits (tripe, tendon, etc.) that I treasure in the best pho halls I frequent in Philly. This is tourist country, after all: "Our clientele won't go for the hard-core Vietnamese proteins," says co-owner Thi Chin, "so we don't bother." But Fusion Plate definitely is worth the bother. The home-cooked Asian flavors were satisfying enough that I won't pass that storefront again without thinking of stopping in for a taste of its banh mi. The Barefoot Market in Ocean City. Crusty loaves of bread from the Barefoot Cafe in Ocean City are worth seeking out. It’s no secret that Jennifer Bailey makes some of the best scones around. But keeping up with her whereabouts has required a persistent focus, as her bakery has moved around north Ocean City and changed names multiple times over the years, from the 4th Street Cafe to Who’s on First, to the lovely, flower-trimmed clapboard home and funky coffee shop on West Avenue now known as the Barefoot Market. The craggy-textured, daily changing scones are as good as ever, with my favorites featuring butterscotch, blueberry and Mexican chocolate flavors. But what’s caught my attention most in recent years is the wide variety of other outstanding baked goods also on offer. There are round and rustic whole-grain loaves breads with crackly crusts and stretchy, high-moisture interiors that make fabulous morning toast. The house-made granola is a step up from anything you can buy at the nearby Acme. And Barefoot’s homey, classic quiches are baked in such irresistibly flaky pie shells with fragrant golden tops that one competitive customer literally snatched an entire warm broccoli quiche out from under me the moment I’d snapped a picture. Grrr … I bought more scones. Daily variations on quiche are among the sleeper hits at the Barefoot Market. This entire broccoli quiche was bought within seconds of its picture being taken. The Northend Beach Grill is a favorite for breakfast behind the dunes. A recent fire closed it down for the summer, but the owners promise to return strong for 2019. The Northend Beach Grill is literally hidden behind the dunes of North Beach in Ocean City, a towering "Open" flag ripping in the breeze overhead the only sign to sunbathers that breakfast or a burger for lunch is nearby. We've made the trek to breakfast there an annual tradition, and, for whatever reason, the Western omelet and crispy waffle in early July were among the best there we've ever had. Simple. Fresh. And with the best porch view of Jersey sand and surf I could ever imagine. Unfortunately, a fire just weeks after our recent visit closed the grill down for the rest of this summer. The good news? No one was hurt. And the owners have vowed: Breakfast by the beach at one of the Shore's best hidden gems will come back strong in 2019. We'll be there.